The following Press Releases were published on various media websites and newspapers in English and Urdu after our MS Awareness Seminar 2015 held on Saturday 30 May 2015 at Koh-e-Noor Hall, PC Hotel Lahore. Click on the icons below to download them in PDF format or continue to read the Press Release below. 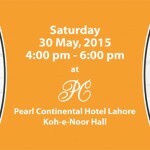 Saturday, 30 May 2015: "World MS Day, that falls on the last Wednesday of May every year, unites MS organizations globally, helps raise awareness about multiple sclerosis and those living with MS to improve public understanding and support that will move us closer to a world free of MS," said Ms. Afroz Syed, President of the Society for Multiple Sclerosis Patients in Pakistan. She further said, "Together We’re Stronger! 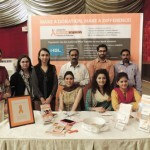 The 2015 World MS Day campaign is focused on finding positive ways to celebrate both the big and small things that people and organizations have done to help make life less difficult for people affected by MS."
The Leading Neurologist of Pakistan, Dr Amir Ikram said, "Multiple sclerosis (MS) is a chronic inflammatory and demyelinating disease of the central nervous system predominantly involving the white matter." 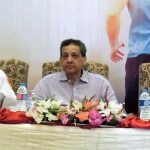 Furthermore, Dr Ikram said, "There has been an increase in the prevalence of MS globally, with studies showing 30 cases in a population of 100,000 that are affected with this neurological disease. The prevalence of MS varies considerably in Asian countries. There are no epidemiological studies available from Pakistan; however, in India, the reported prevalence is 3 cases in a population of 100,000." MS is not uncommon in Pakistan. 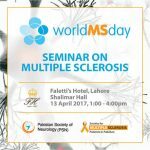 Overall features of MS in Pakistan are similar to MS seen in the western hemisphere. Approximately, three-quarters of the patients are moderately to severely disabled by MS, which could be related to extremely low use of disease modifying agents in our patient population. Dr Ikram further explained, "The mean age of MS patients in Pakistan is 27 years, with female-to-male ratio of 3:1. It is characterized by a variety of symptoms, including fatigue, weakness, and mobility issues. Initially there was no cure for MS, but now there are treatments including oral regimes that help individuals living with the disease to have an improved quality of life." Dr Ikram said, "Diagnosing MS is a complex process and often differs among individuals. A diagnosis of MS is based on the person’s medical history, a neurological examination, and other tests, including an MRI scan to get a picture of the CNS-brain and the spinal cord." Dr Amir emphasized, "Evidence suggests that the best time for a person with MS to start treatment is as early as possible during the course of the disease. It is important for a person with MS to be committed to the treatment thereafter. The earlier treatment is started and maintained, the greater the long term benefits may be for the person with MS. MS is a long-term chronic disease, so it is important for a person with MS to remain on disease-modifying therapy." People living with multiple sclerosis experience many different emotions over the course of the disease. Some of these are reactions to the stresses and challenges created by this chronic, unpredictable illness, while others seem to be symptoms of MS itself. No two people or families living with MS react to the disease in exactly the same way or face exactly the same challenges. Without early diagnosis and proper treatment, the disease progresses and patients experience a worsening of their symptoms. Their physical functioning is drastically affected and MS patients become severely disabled – bedridden, wheelchair-bound or worse. Each recurrent MS attack robs them of various functions and senses, which can affect their vision, cause loss of bladder and bowel control, or weaken their arms or legs. "To gauge the effectiveness of treatments and to determine the load likely to fall on health-care systems, it is necessary to understand the prevalence and natural progression of the disease especially with regard to the quality of life," Dr Amir added. The available treatment is beyond the affording power of many patients in Pakistan. People living with MS often show scarce audacity, persistence, and grace in dealing with extraordinary challenges thrown up by their disease. "In order to combat against MS, patients need coordinated efforts from all stakeholders including doctors, government institutes, NGOs, philanthropists, families, pharmaceutical companies and patient support societies," said Ms. Afroz Syed. Ms. Afroz further said: "Government must play a major role. Family members of MS patients, along with the patients themselves around the country, are trying to reach out to the Government and other institutions for their support so that they can get the required treatment and lead a normal life. In Pakistan, major support must come from the Government, which should set up facilities for early and accurate diagnosis, appropriate disease-modifying therapy, and rehabilitation to make the patients’ lives more comfortable. The immediate and pressing need however is that the government should work out a scheme to provide free treatment for such patients, as the number of cases with such a disorder are manageable." Ms. Syed said, "It is very unfortunate that Pakistan does not have reimbursement policies or proper health insurance system for such patients unlike other countries. The Government must ensure that newer therapies specifically for MS are made available for the treatment of affected patients, so that they may lead a normal life and contribute to the welfare of the country as responsible citizens." Ms. Afroz Syed urged, "These patients need support. They are from among us. They have equal rights to live and have a healthy happy life like all other normal people."